Weymouth, UK, 31st January, 2019: Magicard has today launched the Magicard 600, the most secure printer available to the ID-card printing market. The Magicard 600 is the latest addition to the company’s direct-to-card printer portfolio; developed in response to increasing worldwide demand for regulation of personal information including initiatives such as the European Union’s GDPR requirement. Unlike other ID card printing devices, the Magicard 600 has a digital shredding(TM) capability: once information has been used for a print job, it is fragmented and dispersed, rendering it irrecoverable. The printer also receives push updates from scans against the National Vulnerabilities Database, ensuring that the system always conforms to the highest levels of security. These features are in addition to existing anti-fraud technology available to all Magicard printers, including the pioneering HoloKote® feature, originally developed by Magicard, which allows for the application of a secure watermark to every ID card. Users can load up to 10 anti-fraud Custom HoloKotes® direct onto the Magicard 600 giving them the ability to tailor their cards to reflect an organisation’s logo, or another unique security design. 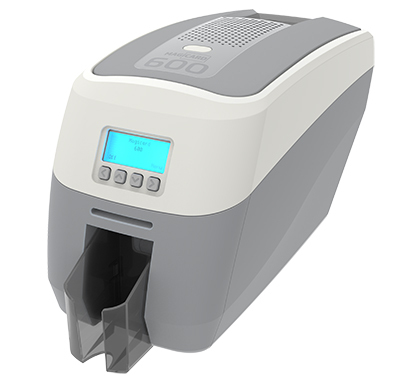 The Magicard 600 is capable of printing at 600 x 300 dpi (resin), allowing users to include easily readable small-point text on their ID cards. The printer has a wide colour spectrum delivering more vibrant and colour-rich output, allowing for a truer representation of the subject which is essential for photographs on ID cards and accurate depiction of corporate logos and other images. The Magicard 600 has Wi-Fi connectivity as standard out of the box via a dongle which is supplied as part of the package. The printer is IEEE 802.11b/g/n compliant with connection of speeds up to 300Mbps and supports WPA and WPA2 encrypted connection (host dependent). The Magicard 600 is available in a selection of colours (minimum order applies). Neutral grey and white is the standard scheme with alternative colours Yellow, Magenta, Cyan, Black and pure White, representing the building blocks of colour. The printer is supported by Magicard’s world-class 24/7 technical support backed up by Magicard’s market-leading warranty which includes printhead cover and a hot-swap loan service so that customers will be never be left without their printer. The Magicard 600 is available in North America, Europe, Japan, South Korea, Australia and New Zealand via selected Magicard partners. Check with your local Magicard dealer regarding availability in your country.